What is the food hourglass? 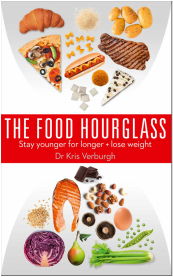 _The food hourglass is the first book that explains how food can affect the aging process. Many people aren't aware how powerful food can be to influence the aging process. The food hourglass explains how certain foods can reduce the risk of aging-associated diseases, like cardiovascular disease, dementia, diabetes or osteoporosis. The book also explains how certain nutrients can affect the external signs of aging, ranging from formation of wrinkles to loss of muscle mass during aging. The food hourglass is also an illustration in the form of an hourglass that can be used as an instrument to make healthier food choices. The upper triangle in the food hourglass contains unhealthy foods which lead to weight gain and accelerate the aging process. The lower triangle contains healthy foods that enable weight loss and reduce the risk of all kinds of aging-associated diseases. What's so unique about the food hourglass, is that you can immediately see how you can replace the unhealthy foods in the upper triangle by healthier alternatives in the lower triangle. For example, you can replace red meat with chicken or fatty fish. Or you can replace soft drinks by green tea or red wine. This way, the food hourglass is a helpful guide to lose weight and reduce the risk of aging-associated diseases. Is the food hourglass a diet? People who follow the recommendations of the food hourglass will lose weight if they are overweight. Therefore the food hourglass can be considered as a diet. The food hourglass works especially well for people who have difficulty losing weight, like overweight people who have diabetes. On the other hand, everybody who is on a weight loss diet is on the wrong track. Studies have shown that most weight loss diets are not efficient in the long term. However, if your food pattern is a healthy one, you can eat as much as you want, you will still lose weight if you are overweight. Another reason why we don't like to call the food hourglass a diet, is because most diets are unhealthy. Many diets favour certain macronutrients or advise against them (like proteins in the Atkins diet or fats in low-fat diets). This way, lots of important nutrients are excluded or prefered, which can accelerate the aging process. Additionally, most diets are too complicated, with long lists of foods you can't or have to eat, or they contain different phases (like the attack phase, maintenance phase etc). This makes it difficult to apply these diets in daily life in the long term. The food hourglass on the other hand is a clear guide. The food hourglass has the shape of an hourglass and clearly shows what foods are healthy and what foods are unhealthy and how to replace this more unhealthy foods with healthier alternatives. It's up to the reader to decide how far he or she will go in following these recommendations. * Regarding fruit juice, The food hourglass dissuades most commercial (store-bought) fruit juices, because they contain a lot of added sugars and no fiber. Fresh home-made smoothies (made with a blender), on the other hand, still contain all the fiber, more healthy substances like flavonoids and less sugar, especially if the smoothies also include vegetables (which contain less sugar than fruit). The flavonoids in fruit and vegetable juices can substantially decrease the risk of Alzheimer's or heart disease. Pomegranate juice consumption for 3 years by patients with carotid artery stenosis reduces common carotid intima-media thickness, blood pressure and LDL oxidation. Clin. Nutr., 2004. Substituting Homemade Fruit Juice for Sugar-Sweetened Beverages Is Associated with Lower Odds of Metabolic Syndrome among Hispanic Adults. Nutr. 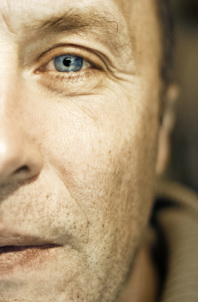 Epidem., 2012. Comparison of the nutrient content of fresh fruit juices vs commercial fruit juices. J. Med. Assoc. Tha., 2002. Food ellagitannins - occurrence, effects of processing and storage. Crit Rev Food Sci. Nutr., 2009. Fruit and vegetable juices and Alzheimer’s disease. Am. Journ. Med., 2006.